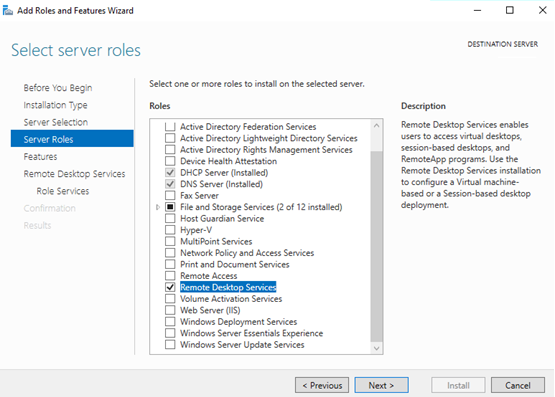 In this article we’ll consider the installation, configuration and activation of Remote Desktop Licensing role on Windows Server 2016, as well as the installation and activation of the RDS client access licenses (CAL). I remind that after the installation of Remote Desktop Session Host role, users can use it only for 120 days of a trial period, and users can’t connect to an RDS host afterwards. According to Microsoft licensing scheme, all users or devices using RDS features must be licensed. 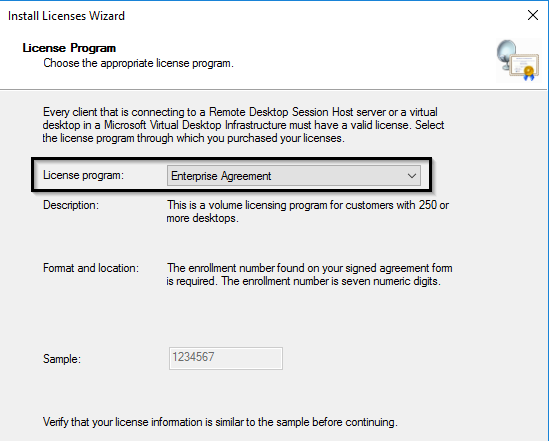 To register and issue client access licenses (RDS CAL), there is a separate RDS role service called Remote Desktop License Server. Before you start the installation, add (or make sure you have the permission to add) a new server to Terminal Server License Servers domain group, otherwise the server won’t be able to issue RDS Per User CAL to the domain users. 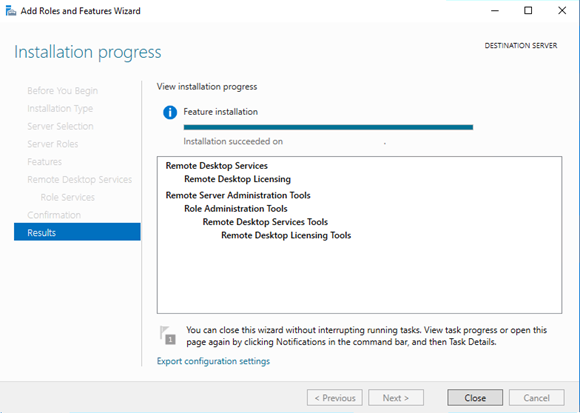 You can install Remote Desktop Licensing using Server Manager. 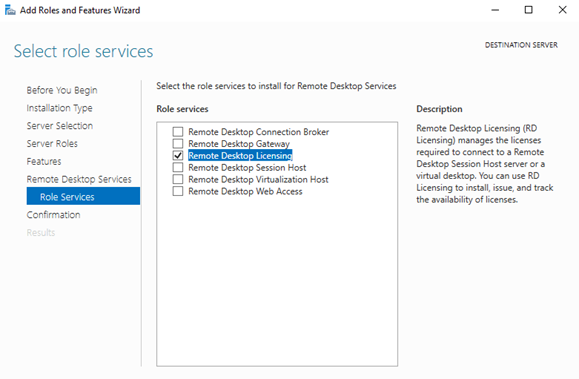 To do it, select Remote Desktop Services role in the Add Roles and Features Wizard. 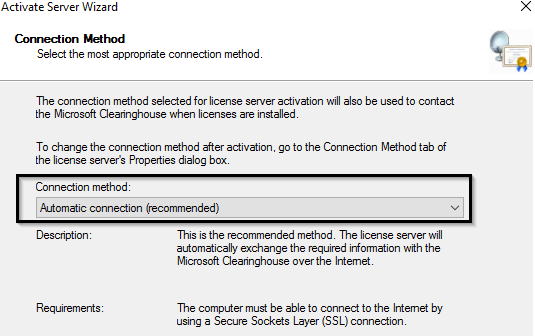 Select Remote Desktop Licensing as the role component. Wait till the role is installed. In order your RDS License Server could issue licenses to clients, it must be activated. To do it, open Remote Desktop Licensing Manager, right-click the name of your server and select Activate Server. 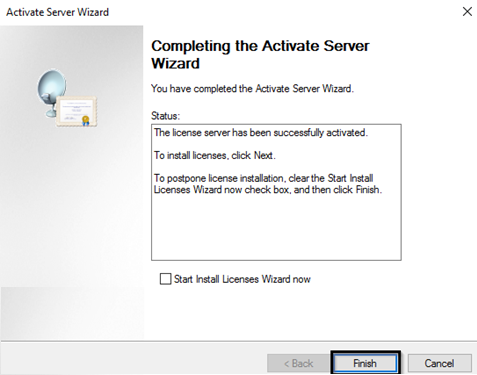 Activate Server Wizard will start, in which you will select the activation method you prefer. If your server is connected to the Internet, it can automatically connect to Microsoft servers and activate RDS license server. If there is no direct Internet access from the server, you can activate the server using a web browser or by phone. 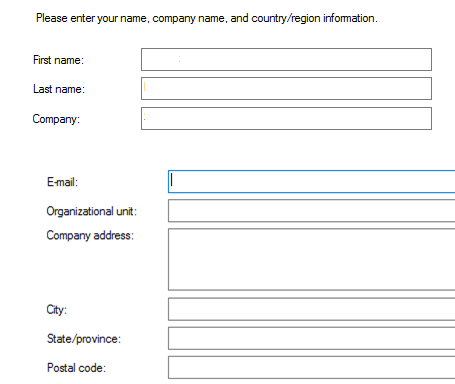 Then you must enter some information about your company (some fields are mandatory). It remains to click the Finish button. If you right-click the server name in the console and select Review Configuration, you can verify that the RDS License Server is activated and can be used to activate RDS clients in your domain. Per Device CAL is the permanent license type assigned to a computer or a device that connects to the RDS server more than once (when a device is first connected, a temporary license is issued to it). These licenses are not concurrent, i. e., if you have 10 Per Device licenses, only 10 hosts can connect to your RDS server. Per User CAL is the type of license that allows a user to connect to the RDS server from any number of computers/devices. The license of this type is tied to an Active Directory user and issued for a specific period of time (90 days, by default). Note. 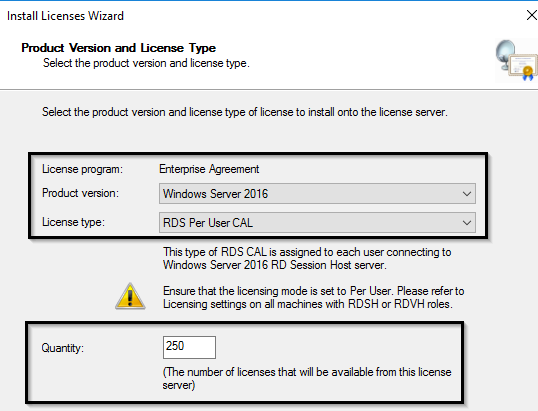 We should note that 2016 RDS CAL may be installed only on a license server running Windows Server 2016, installation of new CALs to the previous Windows Server versions is not supported. 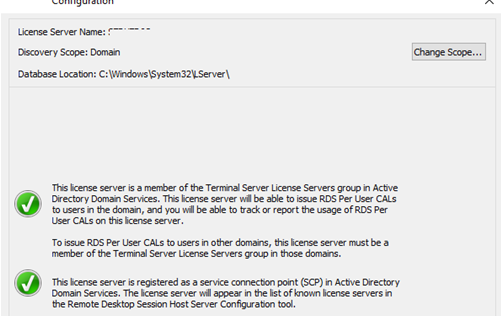 Now you must install the package of terminal licenses (RDS CAL) you have purchased on the License Server. 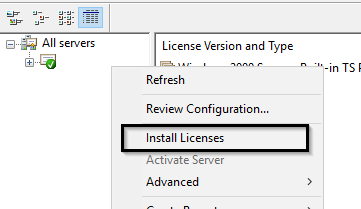 Right-click your server in Remote Desktop Licensing Manager and select Install Licenses. Select the activation method (automatic, online or by phone) and the license program (in our case, it is Enterprise Agreement). 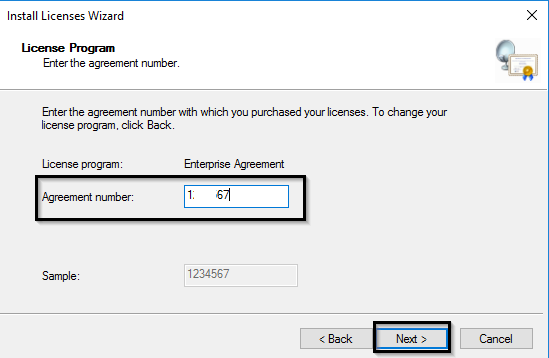 The next steps of the wizard depend on which license program you have selected. In case of Enterprise Agreement, you must specify its number. If you have chosen License Pack (Retail Purchase), enter the 25-character product key you got from Microsoft. Specify product version (Windows Server 2016), license type (RDS Per user CAL) and the number of licenses to be installed on the server. After that, the server can issue licenses (RDS CAL) to clients. After the RDS License Server is activated and running, you can reconfigure RD Session Host to obtain licenses from this server. You can select the license type and specify the name of the license server using PowerShell or GPO. Note. Enter 4 if the server must use Per User licensing type, and 2, if it is Per Device. You can check the License Server status and the number of the issued licenses using RD Licensing Diagnoser (Administrative Tools -> Remote Desktop Services -> RD Licensing Diagnoser). Note. In our case, after we specified the new License Server the following error started to appear on the RDP client: “The remote session was disconnected because there are no Remote Desktop License Servers available to provide a license”. The problem can be solved by removing the L$RTMTIMEBOMB key from the registry. 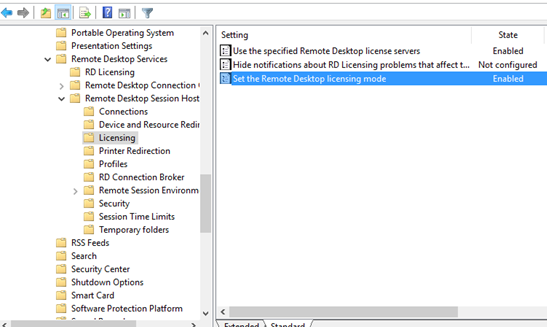 RD Licensing Diagnoser won’t appear until you install the Remote Desktop Session host role. is it necessary to install ADDS to activate CAL in Windows server 2016 Standard? I got an internal inquiry, though I am not convinced why they want to know the details (which server). We have a cluster of dual (active/backup) servers, where the authentication licensing is configured on the main then backup servers (WS2016). A group of users(say 10) initiated sessions via remote desktop to the cluster, but none of the servers is showing any licensing authentication (No of licenses is shown as 0 on the dashboard). But sessions/connections are up. The question is how to determine which server is providing which authentication licensing number to which user, and how to visualize that (not sure if authentication license manager can do that)? Initially 50 licenses x 4 groups (i.e. 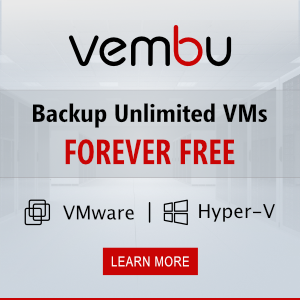 total 200 licenses) were configured on the main then backup servers. It might be confusing and difficult to understand the situation. I hope a professional administrator can advise me and appreciate your early feedback. Thanks. I don’t understand your architecture … If you have 2 RDSH servers, it would be correct to combine them into one RDS farm. You can use any of these servers or third server (for example, with the RD Connection Broker role) an RDS license server.